I grew up watching professional wrestling. I am neither ashamed nor proud of this. It’s just a fact. We in Harlan County, Kentucky had cable TV before the rest of the country because of the terrible signal reception in the mountains. As a result, we had a lot of TV channels and a lot of wrestling. Ernie The Big Cat Ladd, Ric Flair, Austin Idol, Harley Race, Mr. Wrestling II, Baron Von Raschke, Abdullah the Butcher, Maniac Mark Lewin, The Destroyer, Paul Jones, Ronnie Garvin, Bob Fuller, The King of Kingsport Ron Wright, Whitey Caldwell, Wahoo McDaniel, Superfly Jimmy Snuka and many, many more were household names in my home. The Mongolian Stomper was one that always fascinated me. The Stomper was certainly not from Mongolia, but he did stomp a lot of people. He was also afflicted with an unspecified condition which made him acutely sensitive to sound. As protection, he wore wrestling headgear like amateur wrestlers wear. Fans–insensitive to his malady–would scream, causing the Stomper to hold his head in agony. Then, he would stomp the crap out of his opponent. Evidently, he was mute and barely controllable. He stomped, screamed and spit. He often bled profusely. He was a bad guy–a “heel” in wrestling parlance. Of all the wrestling characters I saw over the years, the Stomper–along with Baron Von Raschke–was as over-the-top as any. At this point, I suppose I should confess that I never thought wrestling was “real.” By this, I mean that I knew it wasn’t real athletic competition. For example, Baron Von Raschke was not a Baron nor was he even German–his name is Jim Raschke and he’s from Nebraska. Maniac Mark Lewin did not kill a man using his deadly “Singapore Sling.” Abdullah the Butcher did not actually hail from “Parts Unknown” (he’s Larry Shreve, and he hails from Canada). My father, perhaps disturbed by my interest, made sure I understood that it was for show. This never diminished my enjoyment of it. In fact, I eagerly awaited the next outrageous storyline, such as Ernie Ladd tearing up Wahoo McDaniel’s ceremonial headdress and stuffing the feathers in his mouth or Baron Von Raschke enraging crowds by wearing his Iron Cross around his neck. Occasionally, professional wrestling came to Harlan County. Usually, it was some third-rate bunch, but sometimes we got the real thing. I never attended but must admit that it caught my interest. I’m pretty sure that I didn’t go because I didn’t want anyone to know that I was THAT into. I believe it was in my senior year of high school when fate intervened. Someone (probably me) proposed that the Beta Club handle the concessions for the next wrestling event. Of course, I volunteered. I must digress here and tell you some things about Harlan County. Harlan County is quiet and calm, despite its reputation. Not much happens most of the time, but most Harlan Countians relish the county’s reputation of being a wide-open territory of gun play and lawlessness. Most of us don’t fit the stereotype, but we like it nonetheless. Many of us–me, for example–aren’t tough at all, but we are quite proud to be from Harlan. When we tell someone that we are from Harlan, we mean Harlan County. There is a town of Harlan, too, but I’m not from there. We tend to tell “outsiders” that we’re from Harlan, because most people know the name. Now, if you tell a Harlan Countian that you are from Harlan, he is likely to ask: “Whereabouts?” (Yes, that’s a one-word question). Then, you will say “Loyall” or “Evarts” or “Catrons Creek” or “Punkin Center” or whatever community in the county in which you grew up. Occasionally, however, someone will say something like “I’m from up above Smith.” This will send a momentary chill up the back of a Harlan Countian, because we think: “Wait a second. I know where Smith is, but there’s NOTHING up above Smith!! Where the Hell is this guy from?” The same is true of being from “just past Black Star” or “up above Cranks” or “the head of Jones Creek” or sundry other desolate locales. Even Harlan Countians don’t know these places. These places are, as my father used to say, “off the grid.” The folks off the grid came to town to watch wrestling. While setting up the concessions, none other than Ronnie Sexton asked me if I could bring “the guys” some food. Sexton was a some time wrestler and some time referee. I recognized him immediately. I gathered up hot dogs and some drinks and headed back to the area where (I hoped) the wrestlers would be gathered. The first person I saw was the Mongolian Stomper himself. He was sitting in a folding chair and looked up at me, his forehead a lattice work of scars. What would he do? Hammer me with the folding chair? Scream at me for being too loud? Stomp furiously about while eating his hot dog? Perhaps he would spit on me. Nope. He just put down the book he was reading and said “Thanks.” Oh well, I was already fairly sure he wasn’t a mute anyway. As the crowd filled the gym, I noticed that I didn’t recognize anyone. This looked like a casting call for Deliverance. I guarantee you that the skilled writers of Justified have never imagined the likes of this crowd. They were loud, profane and ready for some wrasslin’. The King of Kingsport himself, Ron Wright, warmed up the crowd by taking the ring microphone and demanding: “Shut up, you toothless, shoeless, inbred hillbillies!” The man knew how to work a crowd. Now, most of the crowd couldn’t have reasonably argued about the tooth observation or the obvious genetic issues, but they must have been quite offended by the shoe and hillbilly references. They pelted the ring with anything they could find. It was great. (Rumor had it that Wright’s airplane was burned one night at the Harlan Airport after a particularly hostile crowd took offense to his baiting. I don’t know if that’s true, but Harlan Countians liked to think it was). I don’t remember who else was on the card that night, but the crowd was loud and insane the whole night. I think The Canadian Lumberjack Joe LeDuc was there–I vaguely recall him threatening someone with his axe. Ronnie Garvin, maybe. What I do remember is the Stomper’s entrance. He came out of the dressing room doing his trademark stomp. When the crowd saw him, they exploded. Spitting, cursing, throwing things–someone threw a chair at him. People removed their dentures and clacked them together like hillbilly castanets. He was in torment over the noise but kept stomping toward the ring. A grizzled, little old lady stepped directly in front of him and flipped the bird. He just spit at her and kept stomping. It was epic. I have never seen anything like it. I looked at the crowd, and I realized that this was what an unruly mob must look like. Honestly, I don’t remember the Stomper’s match. He probably stomped the daylights out of some nondescript wrestler. When he made his exit, I watched him walk back to the dressing room through the same din of madness. As soon as he was out of sight of the crowd, he stopped stomping and became whatever he was when he wasn’t Mongolian. He put on a tremendous show. Then, it was over. The unruly mob became ruly. Everyone left the gym like a basketball game had just ended. They didn’t burn Ron Wright’s airplane–at least I don’t think they did. They headed back to wherever they lived in the outlying areas of the grid. They were all probably fine folks. Like The Stomper, they were part of the show–a scary part, but show nonetheless. These were the real Harlan Countians, and they did not disappoint. The Stomper’s real name is Archie Gouldie. He’s Canadian, not Mongolian. 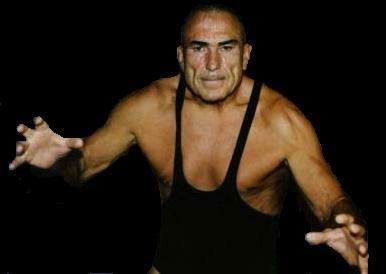 He wrestled in Canada as Archie The Stomper or The Stomper. Apparently, when he came to the States someone thought being Canadian wasn’t exotic enough to turn him into a Mongolian. I’ve read about him and, by all accounts, he’s a fine fellow. He’s not a mute and doesn’t have any super-sensitive hearing issue. But, the guy knew how to work it one night in Harlan. He was worth the price of admission. That was the night the real Harlan Countians met up with the Mongolian Stomper, neither really being what it appeared. They all stepped up and put on a show of a lifetime. It may not have been “real,” but you sure couldn’t tell that night. Oh, that was 30+ years ago and the first and only time I’ve attended a wrestling match. I think I went out on top.